1. Preheat oven to 350 degrees. In a medium bowl, whisk the eggs and milk together. Add salt and pepper. Set aside. 2. In a non-stick skillet, heat about a tablespoon of coconut oil over medium heat. Add onion and red pepper and sauté for 3 minutes, until onion is translucent. Add kale and cook until it wilts, about 5 minutes. 3. Add eggs to the pan mixture, along with the bacon. Cook for about 4 minutes until the bottom and edges of the frittata start to set. 4. Put frittata in the oven and cook for 10-15 minutes until the frittata is cooked all the way through. Slice and serve. 1. Combine all of the ingredients in a blender or food processor. Pulse a few times to break everything up. Then blend continuously until the ingredients have broken down and start to clump together into a ball. 2. Using a spatula to scrape down the sides, turn out the mixture onto a piece of wax paper or plastic wrap. Press into an even square and chill, wrapped, for at least an hour. 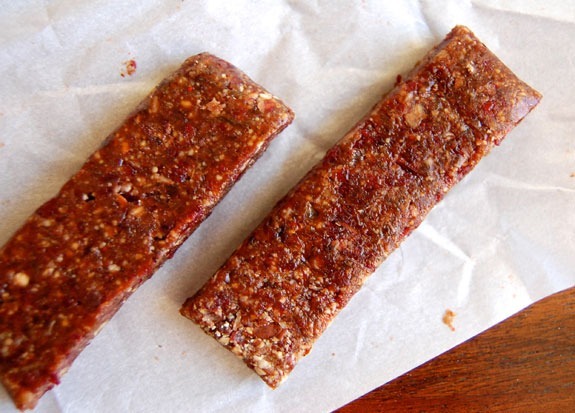 Cut into desired size of bars, wrapping each bar in plastic wrap to store in the fridge. 4. Place one scoop of tuna salad into a large leaf of lettuce, wrap, and enjoy! 1. Place all of the marinade ingredients into a Ziploc bag. Add the chicken, close the bag, and shake to coat. Marinate in the refrigerator for at least 30 minutes, or up to 6 hours. 2. In a wok or large sauté pan, melt the coconut oil over medium-high heat. Add the cumin seeds and cook for 2-3 minutes. Add the marinated chicken and let cook for 5 minutes. Stir the chicken until it begins to brown, and then add the peppers, garam masala, and freshly ground pepper. Sprinkle with salt. Cook for 4-5 minutes, stirring regularly, or until the bell pepper is cooked to desired doneness. Serve hot.